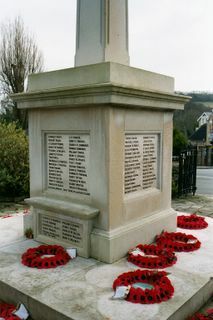 The War Memorial has been included in the list of structures of Local importance held by the Isle of Wight Council (June 2008). 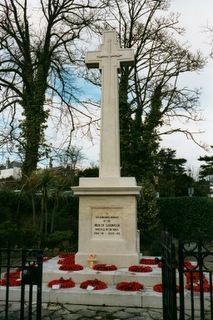 White Portland stone cross, designed by Mr E C Cooper of Shanklin. 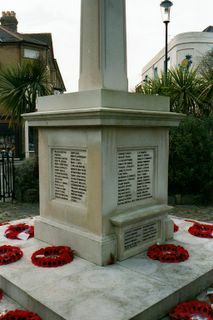 Built by T J Ellery, masons, of Ryde, at a cost of £100. 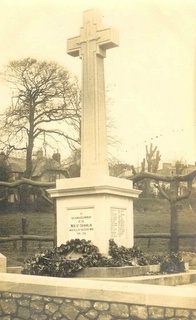 The site, Vernon meadows, was donated by Mrs White Popham, who unveiled the memorial on 11th November 1920, with the dedication being given by the Rev R M Curwen. 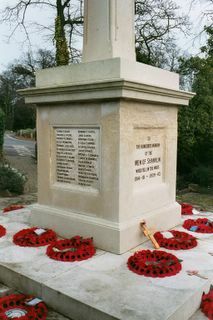 Following a campaign by Mr Derek Kent, the World War II names were added in 1995; the memorial was designed by Mr Barry Hall, and the dedication and unveiling ceremony took place on 11th November 1995. 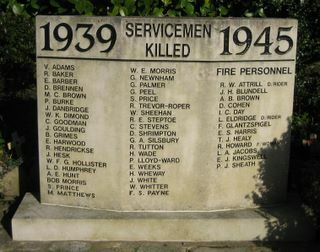 The World War II names include those of 13 Fire Service personnel killed when Shanklin Fire Station was bombed during an air raid on the town. 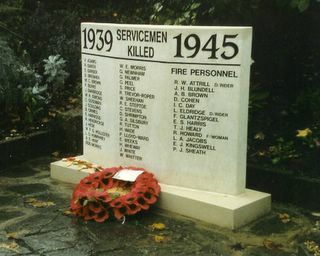 These 13 people are also commemorated on the National Memorial of the United Kingdom Fire Service near St Paul's Cathedral in London. 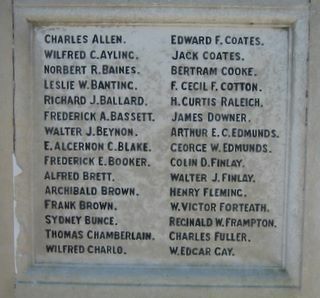 Further names of World War II fatalities have been added subsequently. (These include S Prince, M Matthews, and F S Payne). CHARLES FULLER No CWGC record Charles Pitman Fuller served with the Royal Navy and Royal Naval Reserve from 1886 to 1916. Invalided out of the RNR in 1916, he died in 1917. OXLEY W J HAYDEN No CWGC record Oxley Hayden served with the Rifle Brigade from 1906 - 1915 and was discharged as medically unfit due to epilepsy. 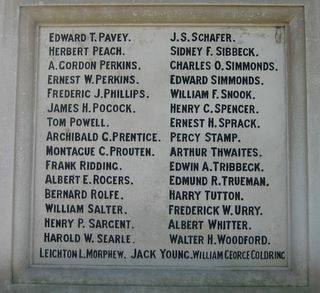 He died in 1918 in Ware, Hertfordshire. H WADE No CWGC record under this name This refers to Harold Frederick Strickley , who had been adopted by Mrs Lane (and later Mrs Wade) of the Napier Hotel, Shanklin. not found for J White. Walter Henry Appel CWGC record ... Born in Newport, enlisted Portsmouth. Son of G. H. and Emily Louisa Appel, of Hampden Lodge, St. George's Rd., Shanklin, Isle of Wight. Died 5th October 1917. The Isle of Wight County Press of 20th October 1917 has the death notice with "second son of G H Appel, East Cowes (formerly of Newport)". 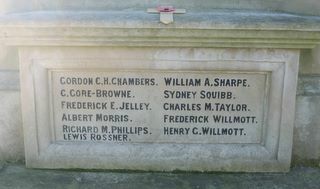 He is recorded incorrectly as APPEL, H H at the Newport War Memorial. James Greig Mitchell Henderson CWGC record ... M.C., mentioned in dispatches. Son of the Rev. James Henderson, of Greengates, Shanklin, Isle of Wight. Died 18 August 1916. Thomas Hull CWGC record ... Son of Tom William Hull, of 2, Gatten Villa, Regent St., Shanklin, Isle of Wight, and the late Isabel Hull. 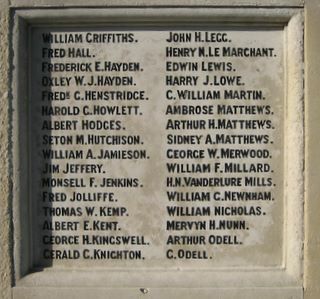 Died 29th April 1917. Reginald Charles Cox CWGC record ... Civilian War Dead: M.A., M.I.C.E. ; of 20 Balliol House, Manor Fields. Son of Charles and Rose Cox, of Craigmore, Shanklin, Isle of Wight; husband of Marguerite Susie Kate Cox. Died at Putney Hospital. Died 18 June 1944, aged 63. Joyce Ethel Glover CWGC record ... Civilian War Dead: of 83 Leesland Road, Gosport. Daughter of Mrs. William Pearce (formerly Mathews), of 20 Hyde Road, Shanklin, Isle of Wight, and of the late William Henry Mathews; wife of Samuel Glover. Died at Tribe Road, Gosport. Died 20 September 1941, aged 21. Walter Reginald Benjamin Tutton CWGC record ... Civilian War Dead : of 69 Gainsford Road Southampton. Son of the late George and Alice Jane Tutton, of Devonshire House, Hope Road, Shanklin, Isle of Wight. Injured 11 September 1940, at the Airport, Southampton; died at Royal South Hants Hospital.